US pharmaceutical Company, Aerie Pharmaceuticals, Inc. is to establish its first manufacturing plant in Athlone. Aerie is a clinical stage pharmaceutical company focused on the discovery, development and commercialisation of first-in-class therapies for the treatment of patients with glaucoma and other diseases of the eye. 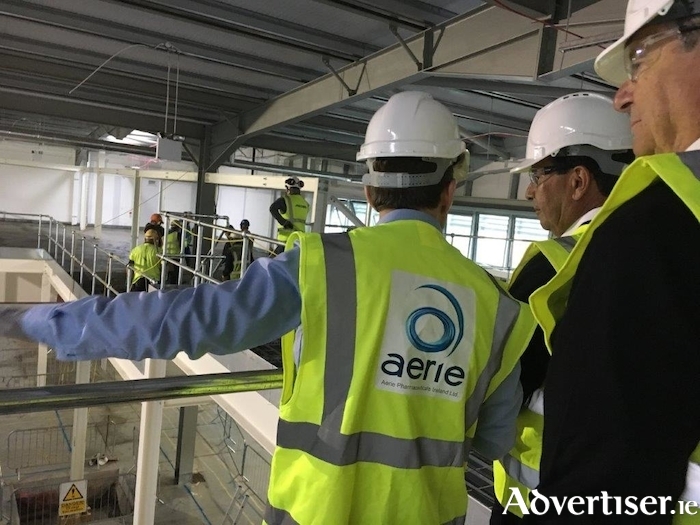 Aerie’s new facility in Athlone is expected to commercially supply global markets with Aerie’s current product candidates, Rhopressa® and RoclatanTM, in 2020. If approved these products have the potential to be classified as the first new mechanisms of action for the treatment of patient with glaucoma in 20 years. This state of the art facility will include end to end operations – compounding, sterile filling, and packaging with all necessary support capabilities. Speaking during his recent visit to the plant Vince Anido, CEO & Chairman of the Board, said “Glaucoma is the second leading cause of irreversible blindness and the number of people with this disease is estimated to grow to 80m globally by 2020. Unfortunately, there is currently no cure for glaucoma, but first-in-class therapies such as the ones we’re developing will help patients to better manage the disease and thus improve the quality of their lives”. Aerie’s culture is conducive to self-starters who will enjoy the challenge of working within a small, high-performing team and being able to apply their experience and passion to a sterile manufacturing start-up. Quality, Science, Engineering and other support capabilities for their new facility in Athlone. To find our more, log on to: www.cpl.ie/Aerie.